Transmits VGA video and stereo audio locally and remotely up to 600 feet using CAT5 cable. 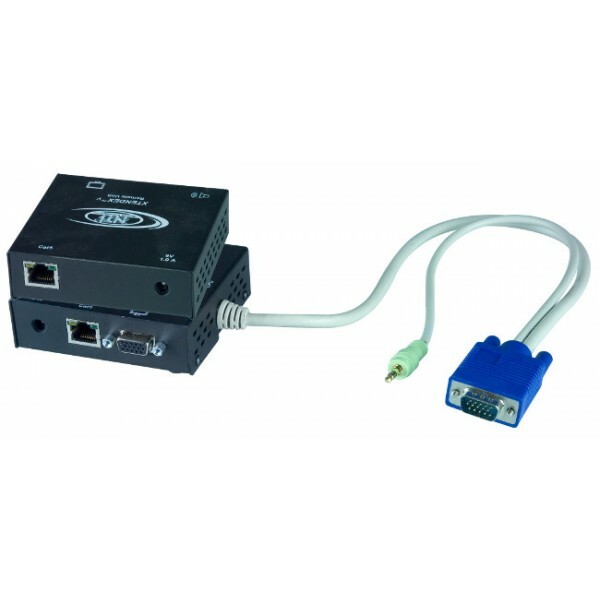 The VGA + Audio Extender transmits VGA video up to 600 feet away from a computer using CAT5/5e/6/6a cable. Each video extender consists of a local unit that connects to a computer and also supplies video to a local monitor, and a remote unit that connects to a monitor. Supports local and remote VGA monitors and speakers. Stereo audio support - 3.5 mm stereo plug. Stereo audio support - 3.5 mm stereo jack. 3.5 mm stereo audio connection. Video quality adjustment for different lengths of CAT5/5e/6/6a cable is done automatically.